The He Mele Lahui Hawaii program is an opportunity to convey the monarchy era splendor of this historic landmark to visitors from around the world, featuring twice monthly pop-up performances by acclaimed Hawaiian entertainer Kuuipo Kumukahi in the Palace’s Imprisonment Room. He Mele Lahui Hawaii is presented in partnership with the Hyatt Regency Waikiki Beach Resort and Spa. Kumukahi is a professional Hawaiian music performer, songwriter and recording artist who has committed her life to the education, preservation, perpetuation and promotion of the Hawaiian language through poetry and mele. 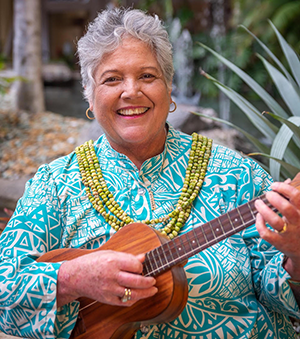 She is currently the director of Hawaiian culture and community relations at the Hyatt Regency Waikiki Beach Resort and Spa, where she serves as the live consciousness of Hawaiian heritage at Pualeilani. A firm believer in community collaboration, Kumukahi supports a variety of efforts to build and maintain community relationships. The following is the 2019 schedule of He Mele Lahui Hawaii performances, which take place from 9:00 to 11:00 a.m. All dates are subject to change. Entry to the Palace is required for these performances. For more information about He Mele Lahui Hawaii, please call (808) 522-0822.